You are cute fluffy little bunnies and hop on the other bunnies' heads. 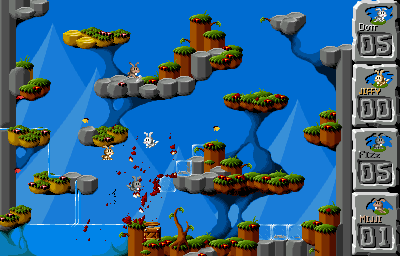 Here is Jump'n'Bump a freeware game, ported from DOS. The game is an 2D arena-style game, were you have to jump on the head of the other. It can be played with up to 4 player. This version implement some AI (that are activated in game with 1-4). a, w, d and j, i, l are the key for the other 2 rabbits. @ejianjo: yeah, AI is pretty basic and young. Not sure there is a simple way to fix that issue. Fun game but the AI has serious issues: if you both go in the water at the bottom left hand corner of the screen the Ai keeps pushing you and you cannot get out without quitting the current game.